When it comes to specialized peels, the preferred option for syringoma removal in cosmetic clinics is TCA. The main reason is that TCA allows easy removal of Syringomas usually within one or two sittings. This makes this product very successful within cosmetic clinics because the client can see the results soon after the first session and the results are achieved within a relatively short timeframe. However TCA is not very easy to control and compared to other types of cosmetic peels, it could be too aggressive on certain skin types and more prone to cause, hypo or hyperpigmentation than other types of peels. Therefore it may not be the best option for home use given that there are milder peels available on the market which are easier to control. TCA is a non-toxic chemical (trichloracetic acid), which has been used to perform skin peels for over 20 years. It is a relative of vinegar (acetic acid.) When TCA is applied to the skin, it causes the top layers of cells to dry up and peel off over a period of several days to one week. When the old skin is peeled off, it exposes a new layer of undamaged skin, which has a smoother texture and more even color. Some dermatologists, in fact, still prefer TCA peels for treating sun damage or melasma, usually in combination with prescription creams. TCA peels are safe in the hands of an experienced dermatologist. TCA peels may be a good option, particularly if you have melasma, because many lasers are difficult to use when treating melasma. Usually, the main choice for Syringoma removal in cosmetic clinics is the use of TCA based peels. This is because if used properly and at the right concentration TCA allows removal of the Syringomas in one or two sessions only. This is ideal to both cosmetic clinics as well as the customers because this allows achieving the best possible results within one session. However, if the concentration is too high or the application of the TCA is not done appropriately there cosmetic procedure could result in mild scarring (a very rare occurrence). On the other hand, if the concentration of TCA is too low the results will not be apparent and the client will not be satisfied. So, by using the right concentration of TCA it is possible to remove the Syringomas in a one or two sessions. TCA is the best choice in cosmetic clinics because results are achieved and appreciable in a short time frame and few sessions. This makes both the client wanting to remove their Syringomas and the Beauty therapist usually very satisfied. The client is happy because their problem is resolved and the beauty therapist has justification to invoice the happy customer. 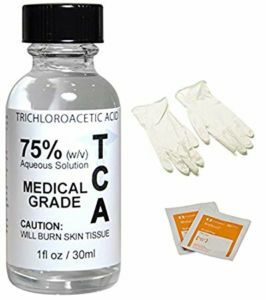 However, the use of TCA requires a certain experience in order to achieve good results. This is because TCA is very effective but not as easy to control and for this reason sometimes neutralizers need to be used during the cosmetic procedure. The main reason for the sort of difficulty of control of TCA is that it is not as easy to neutralise by using water as alternative Glycolic and Mandelic Acid. Dark skin types (type 5 and 6) do not seem to respond as well to TCA because Hypopigmentation develops quite easily after the use of strong TCA peels. Also, skin type 1 is generally quite sensitive to TCA meaning that lower strengths of TCA concentrations may be required for Syringoma removal and therefore Syringoma removal may not be achievable within one to two sessions. It causes a burning/stinging sensation during its applications (normally bearable). Swelling tends to develop on the area where TCA was applied, this generally occurs one or two days after the application. Therefore TCA is the best candidate for Syringoma removal in cosmetic clinics around the world for Syringoma removal as well as removal of many other benign skin lesions because it is very effective in the removal of lesions in general, however given that there are other peels types which can be used without the need to learn about the drawbacks and slight degree of complexity associated to the use of TCA for benign skin lesion removal. to deep peels, the layer of skin removed is greater with each increase in strength of the peel solution. The stronger the peel solution the greater the risk of complications like uneven pigment or even scarring. Watch the effects of TCA for Syringoma Removal being used in a reputable cosmetic clinic. As you can see the effects are similar to some of the products you can buy online. Although it is not mentioned in the video we believe the active ingredients used is either TCA or BCA due to the withering of the area were the product had been applied. Also the mild swelling and well as the dark scabs suggest the use of this type of peels. Click here to watch their very good results in their clinic’s website. Watch this other video below of Specialized peels used in a cosmetic Clinic, you will see the classic whitening where the peel has been applied suggesting the use of TCA or BCA. Another video where probably TCA was used for both Syringoma and mole removal. The after care is minimal after this type of procedure. Although the risks of infections are very low after a superficial cosmetic procedure it is advisable to instruct the client to apply the appropriate antiseptic (cream) twice a day. This will drastically reduce even further the risks of mild infections. In oder to reduce the risks of hyperpigmentation sun screen must be worn daily for at least 3 months after the last treatment.